Make no mistake, Vancouver has made some tremendous strides as a cycling city in the past five years: the Burrard Bridge, Dunsmuir Cycle Track, Hornby Cycle Track, Comox/Helmcken Greenway, and Point Grey Greenway are all vital pieces of infrastructure installed by the current mayor and council. As things go into lockdown in preparation for the autumn election, it’s important to pause and take a look at the bold steps needed to moving cycling past the single-digit mode share it currently enjoys. The following 12 slides describe some ways to do this. These are by no means a comprehensive list, but are designed as a conversation starter. Have any suggestions? Leave them in the comments section! 1. 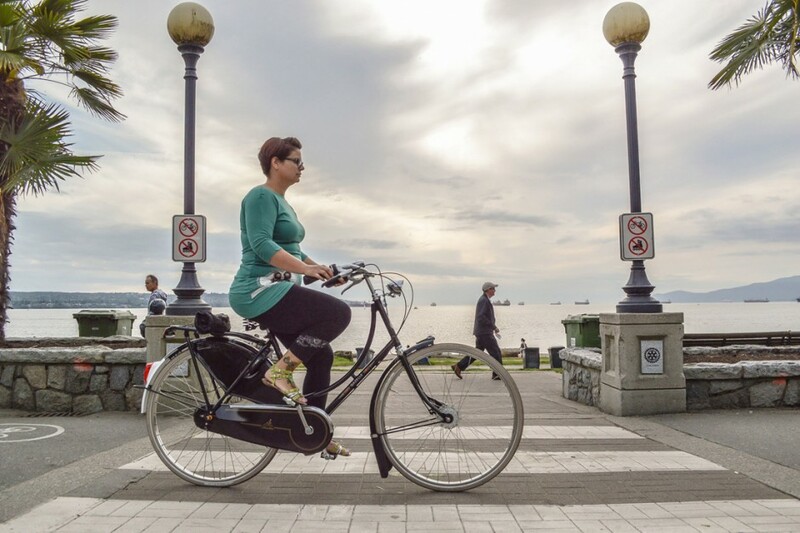 PUT THE BICYCLES “ON BROADWAY” – “If you truly want to mainstream cycling in Vancouver, you have to take the bicycles Off-Broadway and put them on Broadway.” Those were the words of Andreas Røhl, Copenhagen’s Bicycle Program Manager, who visited our city in 2012. While we do have a relatively functional bike network, it is chiefly designed for recreational riding and longer, single-purpose trips (such as cycling to work), as most routes are relegated to residential side streets. But those many other multi-purpose trips one makes in a day (shopping, dining, banking, etc.) become incredibly problematic – particularly with children – when frequenting destinations along W. 4th Ave., Commercial Drive, or Main Street. 2. COMPREHENSIVE BIKE PARKING POLICY – Quality bike parking is a crucial part of encouraging utility cycling in any city. All the bike lanes in the world aren’t worth a dime, unless you give your citizens a convenient and secure place to lock their bike when they arrive at their destination. On that front, Vancouver has been reactive (rather than proactive), and a comprehensive bike parking policy – including a series of new zoning bylaws – is long overdue. Consider Portland, whose corral program converted 100 on-street parking spaces into room for over 2,000 bikes (followed by a predictable increase in economic activity, and a two-year waitlist). City Hall also runs a monthly, complimentary class to developers and Architects, teaching the intricacies of end-of-trip facilities for office towers and condominiums. 3. 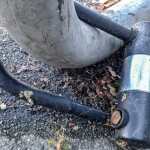 SERIOUSLY ADDRESS BIKE THEFT – Sadly, we have become resigned to the inevitability of bike theft in Vancouver, with depressing consequences. 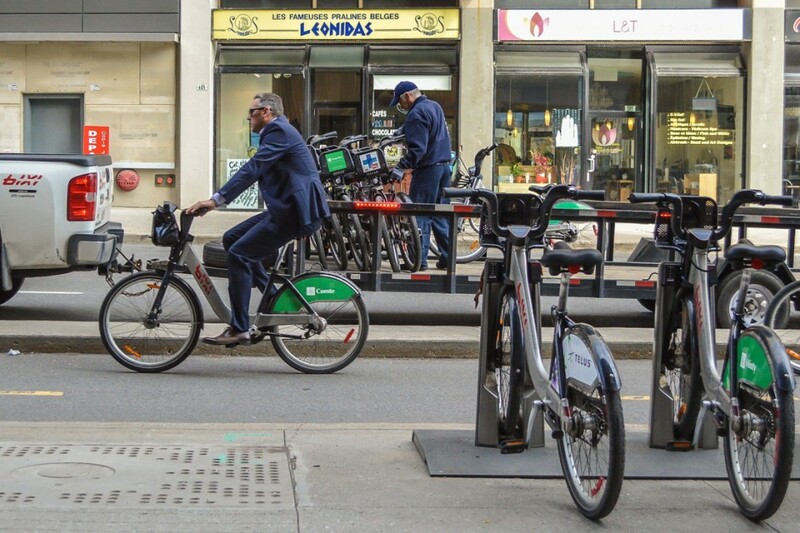 A recent study out of Montreal found 64% of victims neglect to report their stolen bike, and 7% fail to replace it – reverting to other, less active forms of transport. 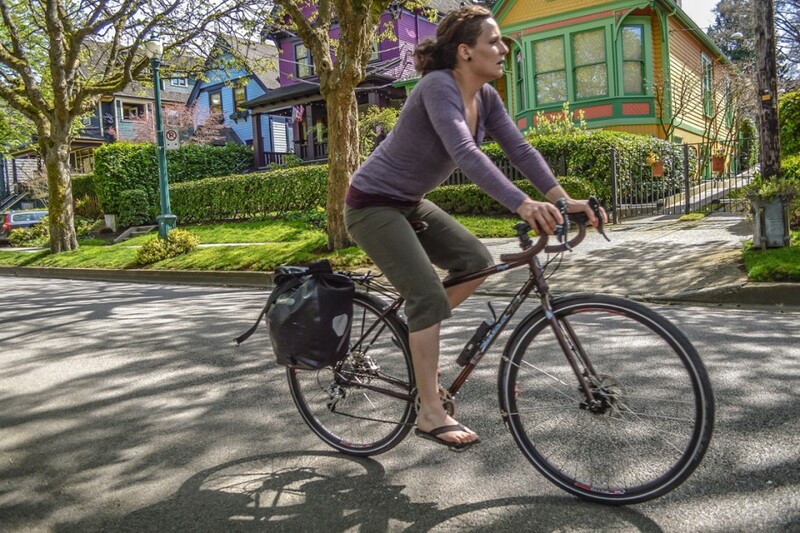 Furthermore, many are hesitant to invest in a bicycle that suits their needs, choosing to ride around on an inexpensive, uncomfortable, and ill-fitted machine instead. They choose a bike practical to store in an apartment, not for riding the streets. It doesn’t have to be that way. Any city serious about growing mode share must tackle theft with an entire array of solutions. A proactive bike parking policy would be an excellent start. As would requiring serial numbers for all online used bike purchases. A discussion with the police about reallocating resources is also a must. 4. 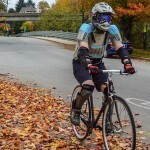 STOP MANDATING ARMOUR FOR A SAFE, HEALTHY ACTIVITY – British Columbia passed an all-ages bicycle helmet law in 1995, based on pressure from one worried suburban Mom, and a single erroneous study provided by helmet manufacturers. Two decades later, it is difficult to overstate how our unnatural preoccupation with (cyclist; never motorist or pedestrian) head protection stifles the growth of our bike culture. It has achieved little, except deterring the most casual, slowest, and safest cyclists from getting on the road. As a provincial leader on active transportation issues, Vancouver staff must take a stand (as have Israel, Mexico City, and most recently Dallas) and push for an evidence-based review of the law, including their own city bylaw that covers parks, pathways, and seawalls. The viability of our public bike-sharing scheme – and the continued growth of utility cycling – depends on it. 5. INTRODUCE A PUBLIC BIKE-SHARING SCHEME – Without a helmet law, Vancouver would have had a functioning bike-share in 2009. 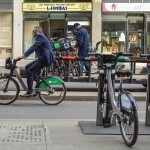 Since then, four hundred cities around the world have enacted such programs, including BIXI’s hometown of Montreal – which recently registered its 18 millionth trip. They have been a game changer: complimenting public transit, getting thousands of new people on bikes, and proving to be remarkably safe (with very few injuries). City staff point to BIXI’s recent financial woes as a reason for the delay, but don’t let that fool you. Without the increased start-up and maintenance costs of providing helmet vending machines, and reduced ridership numbers expected as a result of that barrier; reaching a deal with suppliers has been a lengthy, difficult, and costly process. Pedicabs across the province won a helmet law exemption by arguing it would hurt their business. It is time for the City of Vancouver to make the same case. 6. REGULAR, DIVERSE OPEN STREET EVENTS – I have seen first-hand the transformational qualities of open streets. Whether it’s Portland’s Sunday Parkways, Los Angeles’ CicLAvia, Montreal’s Tour la Nuit and Tour de l’Île, New York’s Five Boro Tour, or San Francisco’s Sunday Streets, these events act as a “real time rendering” to help residents see their city in an entirely different light. 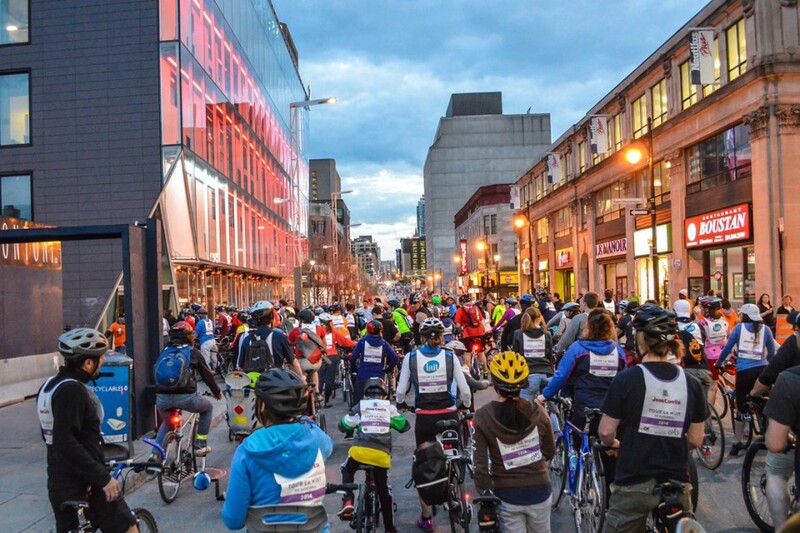 Bizarrely, we do not have such an event in Vancouver that caters to slow, leisurely cycling, despite having dozens and dozens of charity runs. 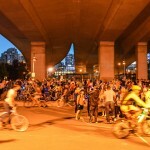 The only thing that comes close is the annual “Bike Rave”, which has grown from a couple dozen cyclists at its first iteration to over 7,000 in 2014. 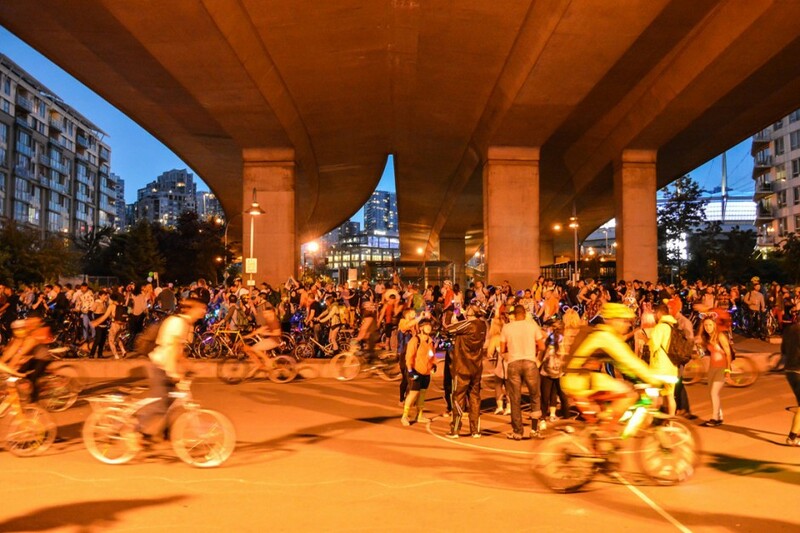 However, we should be holding these events several times a year, every time in a different neighbourhood, in an environment that welcomes Vancouverites of all ages, sizes, and backgrounds to cycle the city streets. 7. ENCOURAGE & FACILITATE CARGO BIKE CULTURE – These inventive, pedal-powered vehicles have roamed the streets of Amsterdam and Copenhagen for decades, but are only now making their way onto North American shores. Living car-free with children sometimes calls for a unique way to transport precious (and not-so-precious) cargo, and this magnificent machine fits the bill. 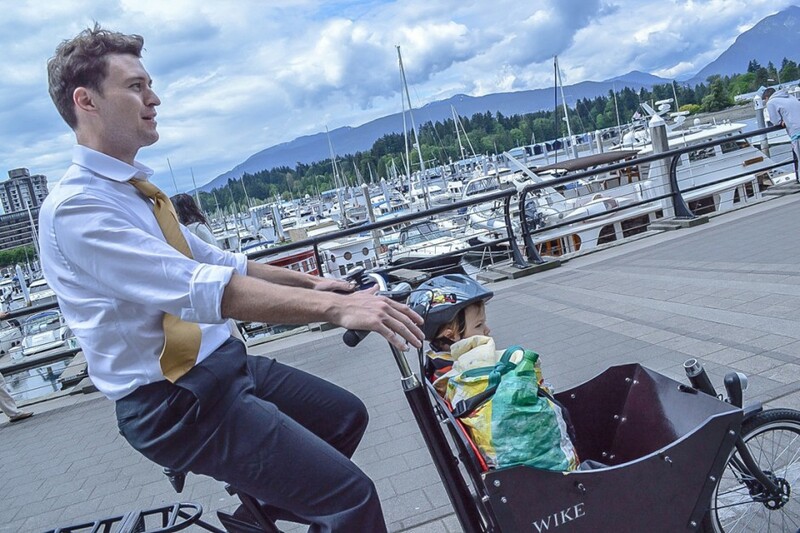 Vancouver’s cargo bike market remains quite small, but growing as our bike network improves. They seem ideal for the cooperative, sharing model, so it can’t be long until Modo (and others) offer them to their members. Of course we will need to consider creative solutions for secure parking facilities (as they have with on-street corals in Copenhagen). Either way, the future is certainly bright for the cargo bike in this city, and I’m thrilled to see it play an increased role in our steadily maturing bike culture. 8. 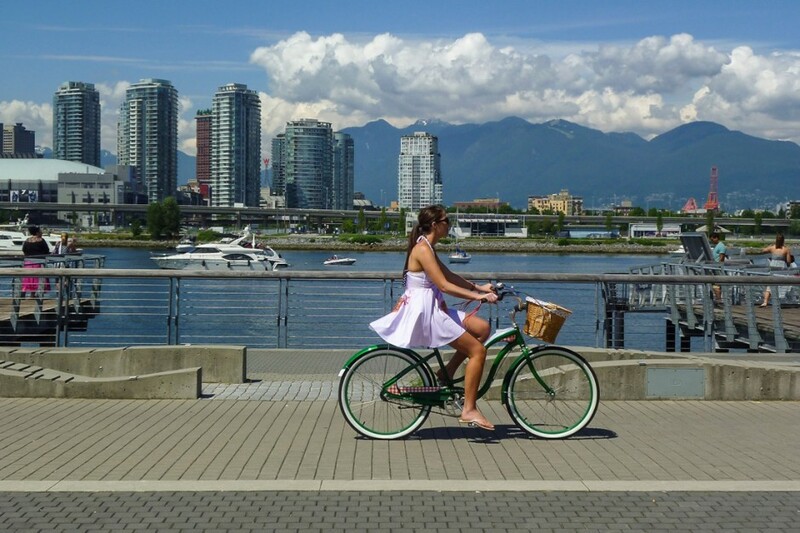 PROMOTE OURSELVES AS A BIKE TOURISM DESTINATION – Tourists come from around the world to cycle our serene streets, separated lanes, and stunning seawall. 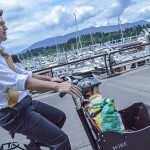 Some hotels and other business are beginning to recognize this fact, providing complimentary rentals, maps, and – in the case of the Fairmont Pacific Rim – a bike butler. However, unlike cities such as Portland, we have failed to take advantage of this fact, and brand ourselves as a bicycle tourism destination. 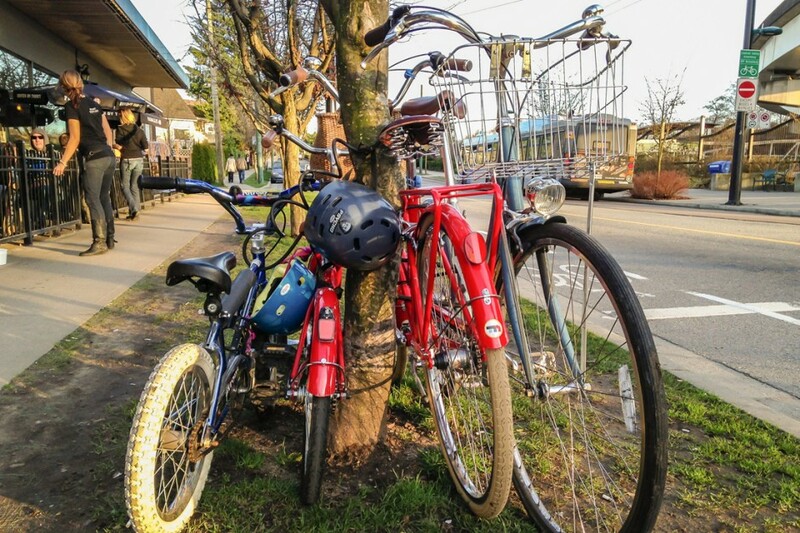 A comprehensive bicycle tourism strategy would go a long way to accomplish this, involving stakeholders such as hotel owners, restaurateurs, bike shops, and those agencies responsible for marketing Vancouver as a spectacular place to visit – on two wheels. 9. MODERNIZE THE B.C. MOTOR VEHICLE ACT –B.C.’s Motor Vehicle Act contains a myriad of outdated and counterproductive rules by which cyclists are expected to adhere. Riding abreast remains illegal, despite evidence that it is safer (and easier for motor vehicles to get around). Doubling someone remains illegal, despite it being an obviously benign act. Riding without a helmet remains illegal, despite studies showing the health benefits of cycling (even bareheaded) outweighing the risks by a ratio of at least 20:1. And “Idaho Stops” remain illegal, despite studies showing they are likely safer than requiring a complete stop at every intersection. For those four examples alone, an evidence-based review of the Motor Vehicle Act is long overdue. 10. 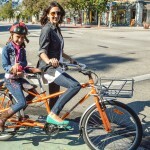 STRENGTHEN THE BIKE/BUSINESS CONNECTION – Another side effect of having our bike network out of sight (and out of mind) is business owners failing to acknowledge the economic benefits of catering to cycling customers. Bridging that gap will take some creative thinking, but is an absolute must if they are to be convinced to put bikes “On Broadway”. April Economides (pictured above) piloted the U.S.’s first Bicycle-Friendly Business District program in Long Beach, CA. This included retail and dining discounts, the conversation of on street parking into parklets and corrals, free repairs, and cycling woven into each district’s events and marketing. 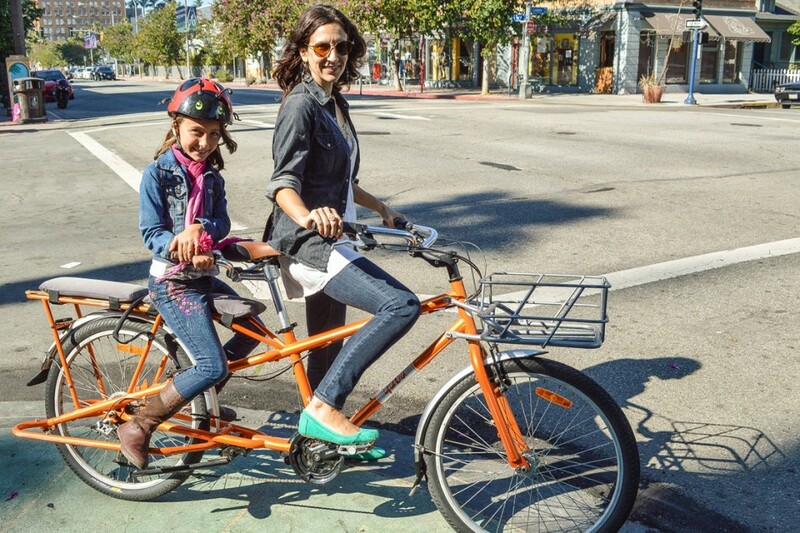 By allowing local merchants and patrons to experience the benefits and challenges of cycling their city streets, they eventually became incredibly supportive of growing Long Beach’s bike network into a number of highly traveled retail areas. 11. INCREASE AND COORDINATE ADVOCACY EFFORTS – There has been one consistent, underlying element to every single great cycling city I have visited in recent years: a sizeable and coordinated advocacy community. The S.F. 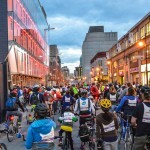 Bicycle Coalition and Velo Quebec have been the two single most impressive examples, each with thousands of paying members and dozens of full-time staff. Both organizations are political forces in their respective cities, executing multiple campaigns over the course of a given month. 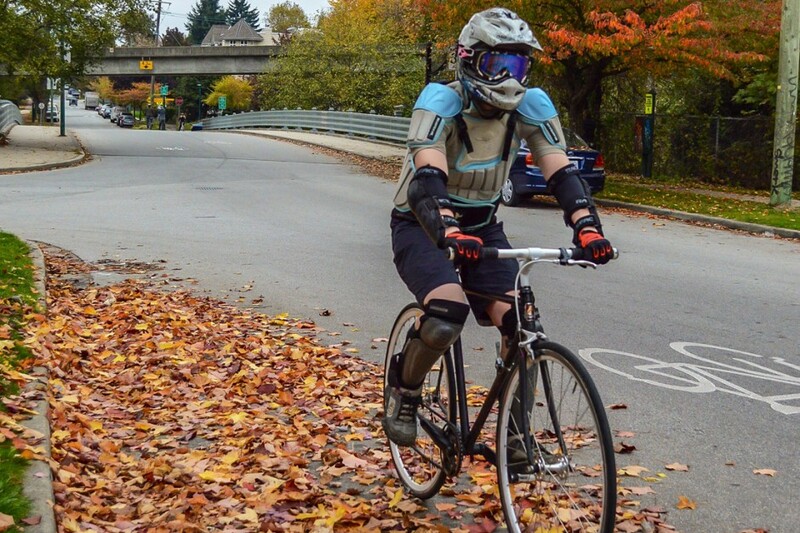 Complementary to these groups are ones in the blogosphere – such as BikePortland and the various city-specific Streetsblog sites – which act as another crucial way for activists to organize, communicate, and push for change. Vancouver has a few scattered pieces of this puzzle, but overall, they lack the collective strength and dexterity of veritable difference makers seen elsewhere. 12. 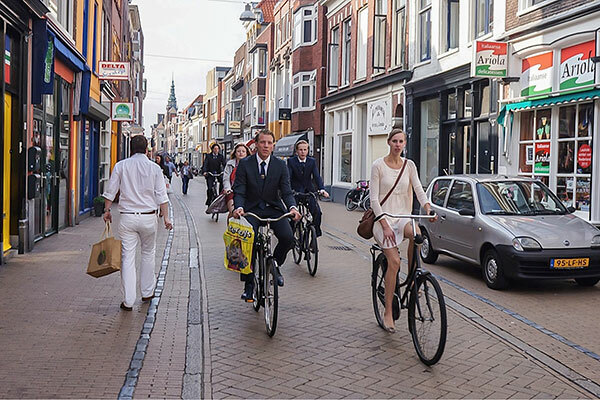 REBRAND THE BICYCLE THROUGH IMAGERY – While city officials around the world focus their efforts on bicycle policy and infrastructure, they continue to overlook a critical third prong of increasing ridership: marketing the cycling lifestyle. This gap is currently being filled by local government, advocacy groups, and the bicycle industry, who often fall into the trap of dangerizing, politicizing, and overcomplicating the act of citizen cycling. Some organizations – such as the Cycle Chic movement – attempt to fill that gap, but have done so with very little support or recognition. It is high time cities see a value in promoting the bike culture they want, through positive and inclusive imagery. Above all, this means allocating resources towards campaigns that effectively rebrand the bicycle as safe, simple, and fun. Note: All images within the slide show are courtesy of Chris Bruntlett. I really think the city needs to work at educating cyclists and enforcing a rule that since all of these designated cycling areas have been created bikes need to stay on them and not obstruct motor vehicle traffic. As both a cyclist and driver I find it extremely frustrating when traffic is held up by cyclists who refuse to ride literally one lane over on the bike lane instead of slowing down the road traffic. I also see a big difference between commuter cyclists and people who cycle on the roads as a form of training or working out. The latter seem to have less respect for the motor vehicles on the road and are less likely to use bike lanes. While I enjoy the improvements Vancouver has made, I take issue with the idea it’s particularly ground-breaking. IMO, if these were ‘vital’ additions, then it’s not ‘bold’ to bring them forth, but the bare minimum we should expect of a responsible, proactive council. Thankfully, we have had positive improvements of late, but what Vancouver is doing isn’t particularly noteworthy or remarkable when compared with other cities of similar size. I agree Stacy…. Commuter cyclists nearly always prefer riding on separated cycleways but sports cyclists want to ride on the road with the cars because that is where they can ride fast. Sports cyclists are not doing the mass uptake of cycling cause any good unfortunately. How about encouraging neighbouring municipalities to follow Vancouver’s lead? As a Burnaby resident, I really notice the difference as soon as I cross Boundary into Vancouver. It would be fabulous if there was a regional cycling initiative. Also, for tourism, Ithink bike tourists don’t generally want to just visit a city–they want to visit a region. 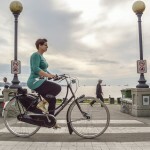 Vancouver and Victoria are nice for cycling–too bad getting to the ferry and riding in the Gulf Islands is not so great. Some parts of southern Vancouver Island are really nice, but wayfinding can be challenging. At one time, bike lanes and separated paths were seen by cycling advocates to be an underhanded method for the car lobby to get cyclists off ‘their’ roads, out of their way. Fortunately, in most US states, “mandatory sidepath laws” have been repealed. Even if there is a bike path available, cyclists can still legally use the roadway. Why? Because in many cases, the bike path is more dangerous. It is either not maintained to the same standard, or it is crowded with pedestrians who would prefer that the cyclist be on the roadway anyway. It is also discriminatory. Good examples of dangerous bike paths are the sections of the CVG at the Renfrew and Rupert Skytrain stations, both badly designed. I always try to avoid the sidewalk in these areas. Also, when it snows in Vancouver, the paths are usually clogged with snow while the adjacent roadway is recently plowed and bare. I would agree that many cyclists probably exceed a reasonable speed on the Vancouver bike paths, but (being a “sport cyclist” myself), it has been my experience that those scofflaw cyclists are not what I would call “sport cyclists,” instead they’re just boorish people on bikes who also run stop signs and red lights. You get boorish people within all groups. As far as cyclists slowing down cars, it has been my experience that cars slow me down (whether I’m driving or cycling) FAR more than any cyclists! If a cyclist is in the middle of a car lane, there is usually a very good reason. Usually it’s to make a left turn, or to avoid a blocked bike lane or a parked vehicle. And the delay is usually quite short, because the cyclist will move over, or is at least narrow enough to pass if there’s room. Why do I never hear motorists complain of slow trucks delaying them? With regard to Stacey’s suggestion that there should be a rule forcing cyclists to always use a bike lane when available, I have many issues with such a rule. In Quebec, there are cases where cyclists are forced to use a route which is one block from the forbidden road. It may be very inconvenient if I am going three blocks and I have to go 2 blocks out of the way. Also, I was recently riding on the new cycle track on Still Creek in Burnaby (near Douglas). This path is so horrid, that I chose the road instead. One should not be forced to use inadequate infrastructure. In the Netherlands, the cycle paths are almost always so well designed and so ubiquitous that one does not even think about riding on the road. North of the Golden Ears Bridge, cyclists are forced to use cycle paths. This is good for the most part, but the no-go zone is extended beyond the area where there are alternate bike paths. Slide #4 makes a number of claims. Citations? It is unfortunate that when this type of discussion is entered into that we still encounter finger pointing with regard to traffic and where cycling fits into the over all picture. It is especially disappointing to see this even among cycling enthusiasts. To suggest that road cyclists are more disrespectful to motorists is not helpful. Nor is it true that road cyclists have not contributed to the “mass uptake of cycling”. Anytime you have increased numbers of bicycles on the road no matter the type helps. Is has been well documented that increased numbers of bicycles on the road increases safety. Long before the upsurge in all forms of cycling in recent years, road cyclists were the vast majority with touring as second in popularity on the roads. It is all well and fine to suggest that separated bikeways will be the best way to increase cycling at all ages, it is not productive to suggest that other forms of cycling are not as responsible for promoting cycling. Some of the comments posted really indicate a lack of understanding of road cycling as a sport. To suggest that cyclists and in particular road cyclists only helps to reinforce the false assumption that roads are only for automotive use. Roads are constructed for the purpose of transporting goods and people. This means that bicycles on the road do not impede traffic, they *are* traffic. It is true however that road cyclists will not use the bike lanes or bike paths for several very good reasons. 2. Road cyclists will use the roads for training purposes not only to improve there fitness but to train in the same conditions as they would when competing. Competitive racing uses the roads, not separated bikeways. To suggest that road cyclists are “more disrespectful of motorists is also misleading. The majority of commuter cyclists will travel any where from 5-30 km per trip whereas road cyclists will be riding 80 km plus. They will encounter far more disrespectful motorist than commuter cyclists may encounters during there trips. 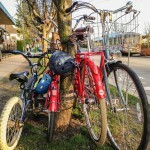 I have seen many recreational cyclists riding illegally and irresponsibly as well doing things such as riding on the wrong side of the road (most common), Riding on sidewalks (although permitted here in Langley), riding without lights or reflectors at night, improper road crossing or left turns and riding through stops signs and red light. Chances are pretty good that if a cyclist rides or acts irresponsible on their bikes, they will exhibit the same irresponsibility behind the wheel. The worst motorists I encounter are pickup trucks, dump trucks and “soccer moms” in minivans. A most disturbing trend is an increase in the number of diesel pickups and their “rolling coal” antics where they slow down beside you only to punch the accelerator to leave you In a cloud of black foul smelling smoke. I have cycled with all types of cycling road users in city, urban and rural areas and see the full range of cycling behaviour both good and bad so I speak from experience. The truth is that there are plenty of road users whether motorists, cyclist, pedestrian and others. What we should be focussing on instead is how do we make the roads safer for all road users. Thank you for this comprehensive article, Chris. 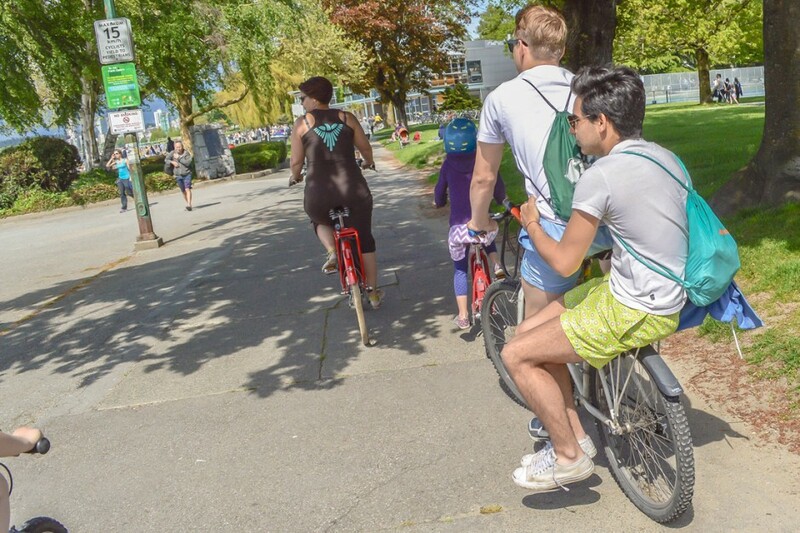 For all the kvetching about Vancouver’s thriving cyclist culture that we hear from some, cycling has now emerged as a central feature of Vancouver’s transportation network — and that’s all to the good for all of us. The ideas you introduce and promote in the pictorial pop-up slideshow are invaluable, and necessary, if we are to remain a healthy society. Let’s hope those in power are listening. In the meantime, for those of us involved in our city’s cycling culture, articles such as yours serve to offer yet another rallying point for advocacy. Let’s keep things in perspective. Less than 4% of Vancouverites cycle to work. That number has barely changed in decades. Despite all the new bike lanes, despite having a municipal council that kisses up to this group to get votes, despite all the column inches of media that has been devoted to the topic, less than 4% of Vancouverites cycle to work. And again – that number has barely changed in decades. Mr. Bruntlett: heard your comments on CBC re the ‘Idaho Stop’…how does this work at intersections? for instance at a 4-way stop intersection controlled by signage: after coming to a complete halt (as all motor vehicles are compelled to) must a motorist give way to a cyclist on the cross street that performs the ‘Idaho Stop’ at the stop signage? how would the by-law apply at light signal controlled intersections? as the by-law now stands all pedestrians must stop and wait for the proper signal or risk a fine for unlawful crossing, would cyclists be given a privilege in any of these conditions? @m ferrari – Under Idaho Stop, the stop is treated as a yield only if one can clearly see no vehicles are approaching / waiting. If other vehicles are present, the stop functions as usual. It’s pretty much how people operate anyway since it’s just common sense, but it would be nice to have the law reflect this. Nice article I especially like the part about engaging the other municipalities in the GVRD to create more bike friendly roads. Cycling in Coquitlam and Burnaby is fun and rewarding and usually less car/truck traffic it would be even more enjoyable if there were bike lanes on the major traffic corridors such as Lougheed Hwy, Canada way, and Kingsway. Hi, I would like to see not only more, but stronger/better public bike racks. 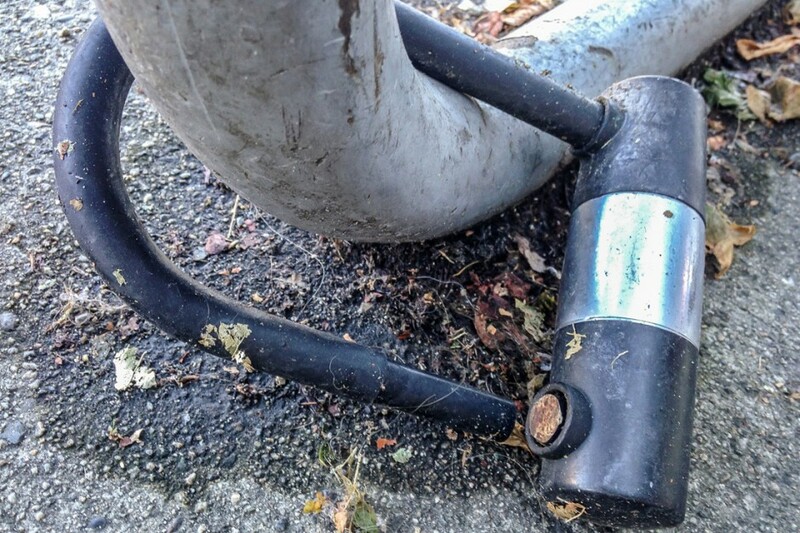 Vancouver is notorious for bike theft. Also, some people (myself include) will lock their bikes to parking meters (street side only) because they are certainly more secure. I think it’s not exactly proper to lock ones bike to a parking meter in Vancouver, but it’s seldom if ever enforced. Also, the public parking lots should have spaces to lock your bike too. However, for such places I would like to see bike spots up front near the entrance so if someone tried to brake a lock they could seen from the street and/or the person in the booth. Thanks for the ideas Chris; feeding our obvious desire for a more friendly city with this type of discussion is terrific. Perhaps we’d be best served by recognizing, as many above have posted, that cycling infrastructure is simply a normal part of a well run city’s makeup. It isn’t an issued to be politicized and owned by one party and not another. We expect ALL political parties to recognize its need and to recognize as well that they will be left in the fringe if they ignore the legitimate and growing demand for cycling infrastructure. The tweet that brought this to my attention suggested a politic tone. I’ve never heard an anti-cycling statement from Kirk LaPoint, yet that was suggested by the tweet of yours. He’s suggested that spending $30k on a bike counter at the S. end of the Burrard bridge is wrong, and as much as I like to see cycling celebrated I find I agree with Mr. LaPointe on that one. Lots of us have thoughts on how certain cycling infrastructure projects could be improved; that doesn’t make us anti-cycling, and we should make such discernment possible without blanket condemnation as “anti-cycling.”. One more slide….KIDS. Make a special effort to make kids comfortable when they ride. Whizzing by them while yelling “on your left” doesn’t cut it. Recognize that the youngest ones are doing their best to ride in a straight line but could easily turn into your path is a just common sense. And yelling at me when I get between you and them and prevent you from doing something dangerous, that’s just bad form. Slow down and wait for a safe place to pass.